I just recently bought a new cookbook, Cravings, Recipes for All the Food You Want to Eat. The book was written by food-lover and model Chrissy Teigen. I took this cookbook on vacation recently and read it like a good novel, I couldn't put it down. Her recipes all look and sound delicious. It's all the recipes I want to make and eat. Chrissy description for each recipe had me laughing out loud, she's hilarious! 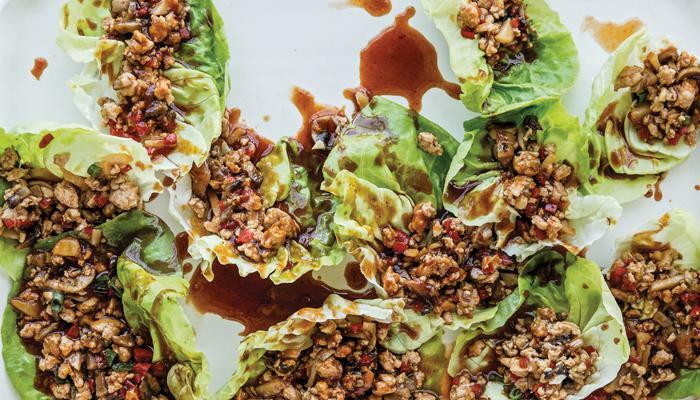 When I got home the first thing I made from Chrissy's book was her Chicken Lettuce Wraps. 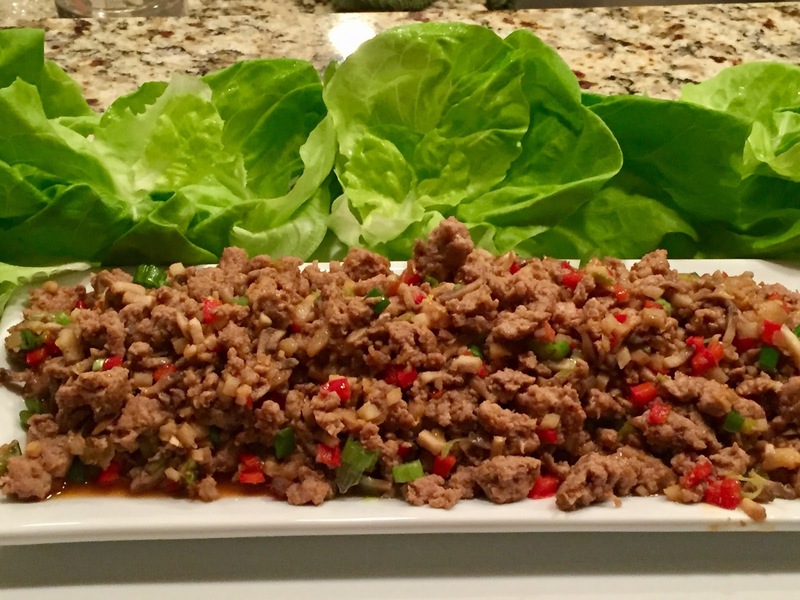 We loved these lettuce wraps! So flavorful, delicious and healthy. I can't wait to make more of her recipes and share them with you but in the mean time check out her book. It's a good read and is packed with great recipes and photos of Chrissy, her family and of course the food. I even saw my husband checking out the book but I'm not sure he was looking at the recipes!! I did change the recipe, but only a little. I used only one tablespoon of Sriracha instead of two. 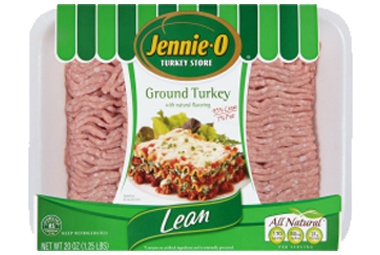 I also used ground turkey instead of ground chicken only because I like the brand of ground turkey from Jennie-O. 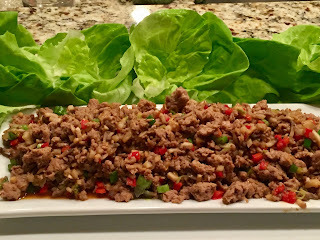 Here are a couple of other brands I used in this recipe. 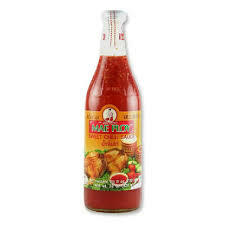 I always have a bottle of this Mae Ploy Thai sweet chili sauce in the fridge as it a good dip for pot stickers. 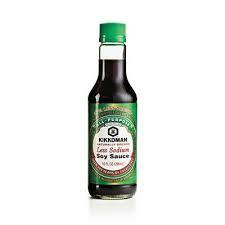 I'm always looking for ways to cut down on salt so I always use low sodium soy sauce. Just looking at these pictures makes me want to make them again soon! 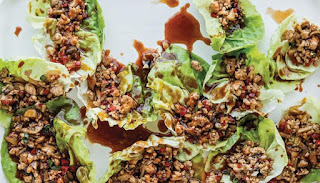 MAKE THE FILLING: In a bowl, mix 2 tablespoons of the sauce into the ground chicken. In a large skillet, heat 2 tablespoons of the vegetable oil over medium-high heat. When shimmering-hot, add the chicken and cook, breaking up the meat with a wooden spoon, until browned, 5 to 6 minutes. 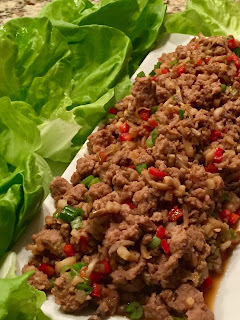 Transfer the meat to a plate and set aside. Add the remaining 1 tablespoon oil to the skillet, then add the scallion whites, garlic, and ginger and cook, stirring, for 1 minute.